Autumn is now well and truly here and people are turning their thoughts to getting their caravan ready for winter. This may include giving your caravan a good wash after a busy summer. If you would rather let someone else do all the hard work then South West Caravan Services can offer an exterior caravan wash service to customers in Barnstaple, Bideford, Woolacombe, Braunton and surrounding areas. If you live further afield we still may be able to help so why not ask us for a quote? Click here to send us a message. Hand washing is by far the best way to clean the exterior of your caravan. Beware the use of pressure washers! These are often too powerful and can direct spray under trim and damage bodywork and seals. South West Caravan Services do not use pressure washers and all our caravan washes are carried by hand with the care and attention you would expect. To keep your caravan looking it’s best, South West Caravan Services recommend having your caravan washed at least twice a year. Giving your caravan a thorough exterior wash at the end of the season is a good idea for a number of reasons. 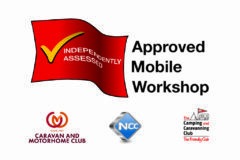 Over the summer your caravan will have accumulated deposits of dust, pollen, road debris etc. If left, these deposits will be much harder to remove in the spring and will encourage the growth of mould over the winter. Spending time cleaning your caravan will allow you time to check the bodywork for possible issues. This also means that you can get them rectified before the worst of the winter weather sets in. Pay particular attention to removing any signs of green or black mould. If left to grow over the winter it can create conditions where the aluminium or plastic surface is left permanently marked. 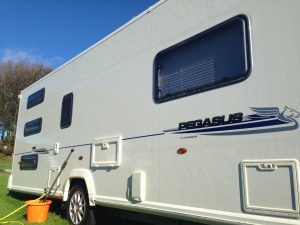 Once your caravan is beautiful and clean you may wish to consider applying an exterior polish which will help protect the bodywork over the winter. There are lots of products on the market but make sure you choose one specifically for caravans. Lastly just a quick reminder on the safe use of step ladders. Washing your caravan will inevitably lead to the use of step ladders and it is so easy to slip or lose your you balance. The Health and Safety Executive (HSE) website has good advice on ladder safety.